TELL US: What's the worst part about being a Blues fan? 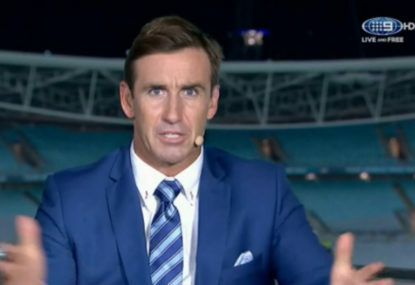 Andrew Johns (Channel 9 screenshot). I’ve spent the overwhelming majority of my adult life watching New South Wales lose games of football. Every year, almost without fail, they find creative new ways to break your heart. Throwing away insurmountable leads, making stirring comebacks but falling agonisingly short, humiliating whitewashes – you name it, we’ve done it. Last night yet again delivered a novel form of self-destruction – getting to within a solitary try of a series victory and then spectacularly throwing it all away. So in the wake of another soul-crushing but probably entirely predictable defeat, we’re left picking up the pieces and negotiating that familiar Thursday morning depression that only Blues fans truly understand. On Roar LIVE tonight, a panel of New South Welshmen (including resident Roar court jester Dane Eldridge) are going to dissect the game and wallow in our collective misery. But as always we’d love to hear from you as well. So tell us: what’s the worst part of being a NSW fan? Is it the selectors? Is it the lingering hope? The…referees? Let us know in the comments what makes you angry and what kills you inside, or if you’re a Queenslander feel free to gloat and throw banter barbs our way. We’ll try to get to as many comments and statements as we can on the show. Roar Live will be streamed this afternoon at around 5:00pm on The Roar’s Facebook page. It will also be available as a podcast on Soundcloud and iTunes.